ParaZYME is a powerful natural intestinal health formula with three unique components to promote a healthy microbial balance in the stomach and intestines, strengthen the protective intestinal lining, and enhance digestion and nutrient absorption. 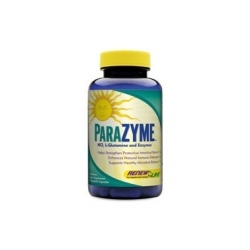 ParaZYME's Protective Digestive Enzyme Blend combines 11 powerfully effective natural digestive enzymes to enhance digestive function and nutrient absorption, as well as helps relieve occasional gas and bloating. Betaine Hydrochloride helps to protect against harmful intestinal parasites. And the Intestinal Protective Blend combines the amino acids L-glutamine and N-acetyl D-glucosamine with antioxidant-rich quercetin and nutritive gamma oryzanol (from rice bran oil) to help strengthen the protective intestinal barrier and promote overall intestinal health. With today's diet of cooked and processed foods, many of the vital, natural enzymes in foods are cooked out. Even with the healthiest diet, if you're not digesting your food well, your body is not getting the valuable nutrients that it needs. ParaZYME contains a probiotic blend of Lactobacillus acidophilus, Bifidobacterium bifidum and Bifidobacterium infantis helps to maintain a healthy intestinal bacteria balance.